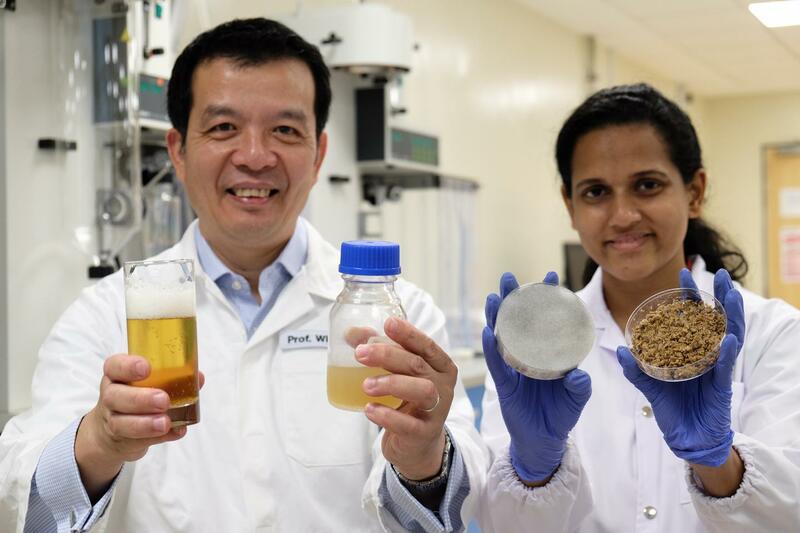 Scientists from Nanyang Technological University, Singapore (NTU Singapore) have invented a new process to turn spent brewery grains into a valuable product that can grow beer yeast. Spent grain amounts to as much as 85 per cent of a brewery's waste. This is of little value, so the discarded grain is often used as compost or for animal feed. Innovative approaches to extract value and re-use these discards are actively sought by the beer industry. NTU's research findings were published recently in AMB Express, a peer-reviewed scientific journal in the area of applied and industrial microbiology by SpringerOpen. Professor William Chen, Director of NTU's Food Science and Technology Programme, who is leading the research, said the new conversion process turns brewer's waste into a valuable liquid nutrient, as similar commercial liquid nutrients are sold for US$30 per litre. In comparison, the team's upcycled liquid nutrient is produced at only a fraction of the cost. This waste-to-nutrient technology took Prof Chen and his researcher Ms Sachindra Cooray, a PhD student from NTU's Interdisciplinary Graduate School, two years to develop. The innovation has drawn the interest of several international beverage companies, including Asia Pacific Breweries (APB) in Singapore. Prof Chen is now in talks with several companies to license or commercialise the proprietary technology. "We have developed a way to use food-grade microorganisms to convert the spent grains into basic nutrients that can be easily consumed by yeast," explained Prof Chen. "About 85 per cent of the waste in brewing beer can now be turned into a valuable resource, helping breweries to reduce waste and production cost while becoming more self-sustainable." Associate Professor Xu Rong, Interim Chair of the School of Chemical and Biomedical Engineering, said the burgeoning global population increasingly strains conventional food sources, so there is a need to innovate new foods and processes to alleviate the increasing demand. "Discovering new uses for different types of natural food grade microbes in waste-to-nutrient technology is the latest breakthrough by NTU chemical and bioengineers, which can help to address the food security issues faced by the world presently," Assoc Prof Xu said. "By upcycling waste to usable nutrients, conventional resources used to grow yeast can now be diverted into the production of wholesome foods," she added. Over 193 billion litres of beer are produced annually worldwide, which is enough to fill 77,000 Olympic-sized swimming pools, generating some 39 million tonnes of spent grain. For every five litres of beer produced, one kilogramme of spent grain is created. Spent grains donated by APB were used in this research project. Mitchell Leow, Head of Corporate Affairs at APB Singapore, said: "This research is a testament to how science and innovation enables companies to find novel ways to be more sustainable in their operations." "Sustainability is a business priority, especially for a large-scale commercial brewery like APB Singapore. We take great efforts to reduce our waste footprint, through such circular processes that ensure materials like spent grain, glass bottles, and even waste water are repurposed and not simply discarded." When grains such as barley or hops are fermented by yeast, the grain's sugars, protein and nutrients will be stripped, leaving behind plant fibres known as lignin. While lignin is tough and generally unusable in food production, certain types of microorganisms are able to break lignin down into smaller, nutritious pieces. These nutritious pieces can then be mashed and turned into a liquid, which are easily digestible by yeast.